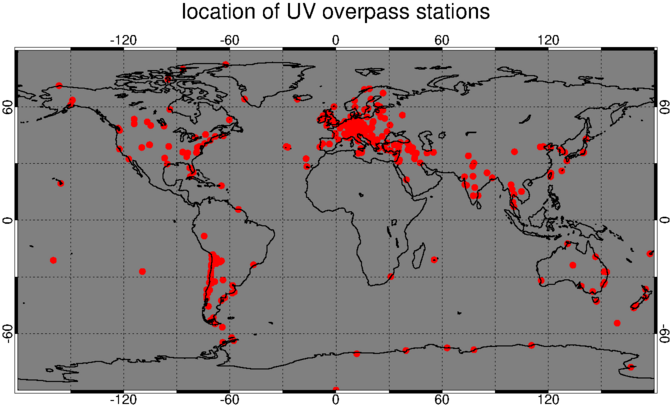 Time series UV index and UV dose data derived from the Multi-Sensor Reanalysis (MSR-2) assimilates ozone data -- so-called overpass files -- are generated from the UV data archive for selected places. 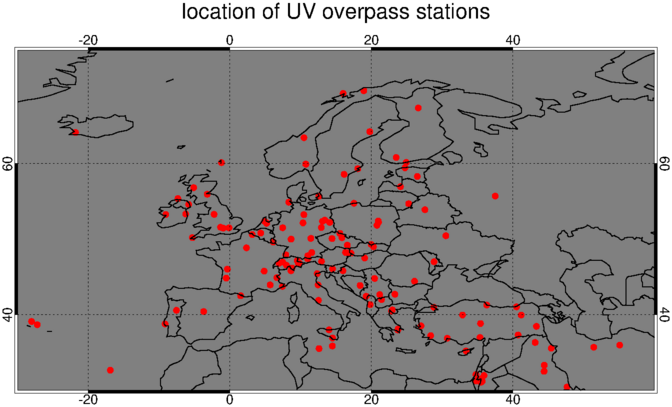 For all stations the overpass file contains the cloud-free UV index and UV dose data for the MSR-2 period: April 1970 - December 2017 (one day is missing: 31 Dec. 2012). Cloud-modified UV dose data is not computed, since cloud cover data is not available of the full period. Information on the structure of the data files is given below the table. In order to reduce file size, each file is zip-ed. validated thoroughly; please treat that part of the data with care. TEMIS UV index and UV dose MSR-2 data products, version 2. Dataset. Royal Netherlands Meteorological Institute (KNMI). The location of the stations is marked by red dots. hence those data columns have -1.000 throughout. with the surface albedo is derived from a climatology; for details, see this page.